The art of conversation is mostly about listening, whether conversing verbally or by playing notes. 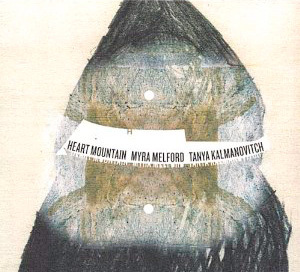 A fluent and empathetic conversation between viola and piano (or occasionally harmonium), mostly in the form of free improvisation, Heart Mountain is a rare album that stands apart from the crowd; one which stopped me in my tracks. Although almost all of it is freely improvised, in terms of 'feel', it is often closer to avant-garde classical music than jazz. This is not a negative observation, however, for Heart Mountain transcends categorisation; it is simply one of the most arresting performances I've heard – in any genre. Tanya Kalmanovich's playing on this album has a mesmeric and fully-realised voice of its own. She is a widely acclaimed Canadian violist and violinist, classically trained at the Juilliard School of Music. Among her posts, she is Assistant Chair of the department of Creative Improvisation at Boston's New England Conservatory, as well as being an instructor at the Guildhall School in of Music in London. She has repeatedly visited India to study music and conduct research for her doctoral dissertation on jazz exotica. Myra Melford, whose performances here display great sensitivity and technical facility, is a seasoned jazz pianist. She has over thirty recordings in her catalogue, in nineteen of which she is the leader or co-leader. She trained classically until her college years, when she developed an interest in improvised music and blended an avant-garde approach from studies with Henry Threadgill and Don Pullen, with her classical background. To these she added an Indian influence: in 2000, she was awarded a Fulbright scholarship to study North Indian music in Calcutta, which she undertook over 2000 and 2001. She has been on the faculty of music at U.C. Berkely since 2004. All but one of the performances contained in Heart Mountain are free improvisations. The dialogues show a deep rapport between the two musicians; by turns hypnotic and unsettling, the music unfolds at the speed of thought as they feed off every scrap of an idea contributed by the other, each track unfolding a unique story. Names were attached to the tracks afterwards; in some cases they are uncannily fitting: Into a Gunny Sack and Into the Kootenay River not only conveys the menace implied in the title but, as is pointed out in the excellent interview with Benny Lackner on the Brooklyn Jazz Underground Podcast, one passage of Myra's very effectively evokes a terrifying ride upon torrents of water cascading over rapids. This is an album that will not fade from memory over the years; an album to which I will regularly be returning – for me, one of the classics of improvised music.